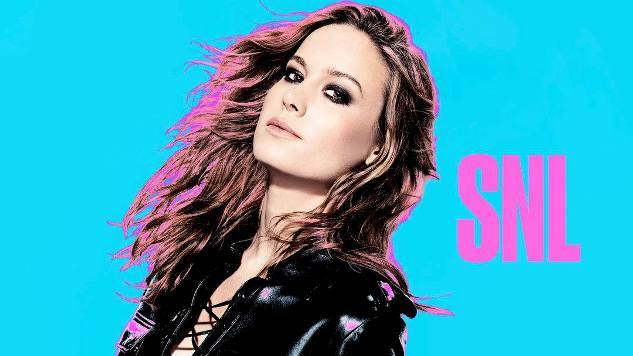 Saturday Night Live Review: "Brie Larson/Alicia Keys"
With a season-ending trilogy upon us—Brie Larson/Alicia Keys, Drake, Fred Armisen/Courtney Barnett—it may be tempting to throw in the towel on a another frustrating season of Saturday Night Live, to resurrect the “Saturday Night Dead” trope and begin the deconstruction. Writing SNL reviews for Paste, I am often chided by friends: “Why do you still watch that awful show?” “It is so bad!” “Saturday Night Live hasn’t been funny in years.” The simple answer is that I think every episode of Saturday Night Live, good or bad, is a small miracle. I enjoy watching talented people make live comedy on TV. I’m a longtime fan of sketch comedy and popular music. And…there’s always something funny on the show. It’s not like SNL just stopped being amusing when Kristen Wiig or Will Ferrell or Dana Carvey left. It’s just seems like that because that’s when you stopped following the show. Comedy is a funny business. It is a work of art and craft…and quite often, dumb luck. SNL’s 41st season started pretty shaky (as it does most seasons) and then found its groove. Or more aptly, found a reliable path to funny. Watching this happen in real time can be maddening, but…it’s why I watch. And as we arrive at the end of another season of trial and error, it has become a pleasure. Speaking of “in my day, Saturday Night Live was actually funny,” Dana Carvey’s iconic Church Lady returns in the episode’s cold open. Carvey’s pious Sunday School teacher is classic school boy parody, broad like old-SNL, and ironically enough, preachy. Even when the Church Lady was a staple of Saturday Night Live, she’d arrived a decade after she might have been considered prescient or sardonic. To see her return is more an exercise in nostalgia than satire—the contemporary Church Lady’s sanctuary is her self-righteous cause blog and Twitter feed. They don their hairshirts all over your Facebook wall as evangelists for a Presidential candidate—and woe to those who oppose said candidate. Still, it’s an effective way to bid farewell to the candidacy of damningly pious Ted Cruz and play with Darrell Hammond’s always brilliant Donald Trump. Carvey really is one of the best performers to ever appear on Saturday Night Live. And his aging face has never looked better under the Church Lady’s battleship gray wig. He goes all in for this (he always does), and even though the 2016 studio audience is not as raucous as his late ‘80s audiences were, he sells the hell out of the bit. Brie Larson as guest host on Saturday Night Live is certainly one of Season 41’s best. She effortlessly glides from role to role, smartly playing the characters given her instead of the punchline. She is so prepared for each sketch: lines memorized, fully engaged in playing the scene, unflappable on the live television stage. Larson is enjoying herself, but it is the joy of the work that animates her appeal. Indeed, if she hadn’t just won a Best Actress Oscar for her work in Room, she’d be a shoo-in to lead the next big NBC sitcom. SNL may be a new challenge for the actor, but she is undaunted. Detractors of SNL41 may have missed the show’s best new character and sketch form in years: Kate McKinnon’s Ms. Rafferty From “Near-Death Experience.” First seen in the Ryan Gosling-hosted episode, McKinnon’s character returns with hilarious tales from yet another disappointing brush with the supernatural. While seeing co-stars Aidy Bryant and Bobby Moynihan trying to stifle laughs is a treat, it is the perfect marriage of writing and character-craft that makes this sketch so great. Should Kate McKinnon stick around for SNL42, expect a lot more of Ms. Rafferty. Weekend Update has found itself after a couple of lost years. Co-hosts Colin Jost and Michael Che have discovered a rhythm that finally feels natural and well suited to each man’s talents. The jokes are fresh, pointed and, at times, not entirely successful. But they seem okay with that now. The misses are quickly smoothed over while the next joke is teed up. This is confidence—in both the material itself and their ability to perform. Che is still the more natural stand-up comedian of the two, Jost the earnest joke-writer. But the combo has persevered and may live to see another season. “Game of Thrones: Jon Snow” gives vent to a frustration many of us obsessive/binge watchers in the so-called “Golden Age of Television” have—the prolonged, overly-wrought, sometimes multiple episode dramatic detour. Here, two impatient onlookers compel the mystic powers that be to get on with it—resurrect Jon Snow and get back to the good stuff! Like “Baby Shower,” a Mothers Day-inspired piece about a woman for whom its time to get the cliché suburban mom haircut, “Jon Snow” is exceptional, one-joke sketch-making. This is Saturday Night Live’s bread and butter: it’s an uncomplicated in-studio comedy with jokes that are easy to get. It’s how the show made its mark in its first five years. And successful sketches like this have been in short supply the past several seasons. Alicia Keys performs new songs “In Common” and “Hallelujah,” demonstrating to the various up-and-coming pop stars of the world what an adult artist in her prime looks like. Keys stands behind an upright piano for both songs, backed by incredible musicians, and serves up two technically flawless, yet heart wrenching live vocal performances. She smartly plays to the live studio audience, but also breaks through the screen to those of us watching elsewhere. It is a worthy follow-up to last week’s impromptu Prince tribute show. Ignore the detractors. Saturday Night Live is actually pretty good right now. It’s worth watching, at least. And though it may not make you forget those heady Will Ferrell days of youth, it does have its moments. Chris White writes and directs independent feature films. His latest is Unbecoming, a southern gothic comedy starring Patti D’Arbanville and Michael Forest. Follow Chris on Twitter.